Do we have a thread for Bachelorette 2018 yet? Cause look who's name is being thrown around for Lead... Casey Donovan! @Bobette on the home page. @GuardianAngel wrote: @Bobette on the home page. When I click this link it takes me back to this home page? This is the bachelor season 6 not the Bachelorette. @Storybook what would I do if I had a brain. Sorry, totally misunderstood thinking it was the 'ette thread. Thank you for pointing that out. I will create it now. This is the correct link. @GuardianAngel wrote: This is the correct link. What in the world are they doing? Is them picking celebs going to be the rule of the game now?? I thought that Sophie and Georgia were the exceptions? I wish they'd choose someone from this season of the bette like James for example. I really think Apollo might be the next Lead. Kris Smith is the only other name I've heard being thrown around, but he's in a relationship, and has already come straight out and said he's not interested. 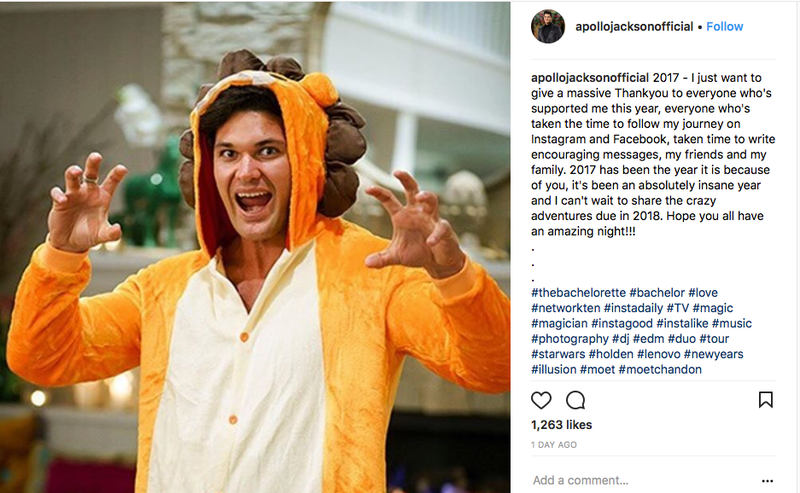 Apollo is still including #bachelor and #bachelorette hashtags with every post, and in his latest he hinted at "crazy adventures" due to come in 2018. "Adventures/journey" seem to be key words for Leads IMO. What about James as the lead? He is marketing himself a lot on Instagram, very similar type posts to Matty leading up to the Bachelor. Lots of family photos with babies and plenty of outdoorsy type pics where he's shirtless. Definitely showing that he's a catch. Am I still able to hope tptb might go for someone new and not an ex contestant?? @BlueJeans wrote: What about James as the lead? He is marketing himself a lot on Instagram, very similar type posts to Matty leading up to the Bachelor. Lots of family photos with babies and plenty of outdoorsy type pics where he's shirtless. Definitely showing that he's a catch. You could be right, @BlueJeans - I think it's suss that neither guy has posted any pics of themselves with girls, only family/babies/puppies. The thing that stands out as different to me is that Apollo is the only one using the #bachelor tag. I could see him using #bachelorette since that's where he's known from, but #bachelor... hmmmmm. Also they subtley mentioned about 10435677 times how much of an "old soul" Apollo is when he was on the show, which makes me think they are wanting people to overlook his age. Why would they care unless they're lining him up for something more... that's the way I'm thinking. Maybe it's all just promo for Bach in Paradise though. We'll see. @LeapofFaith wrote: Am I still able to hope tptb might go for someone new and not an ex contestant?? That would be my preference too. I'm just surprised there hasn't been more "noise" about potential leads. If it was a celeb or someone known, I'd have thought by now someone would leak. Though, Sophie came out of the blue so who knows.